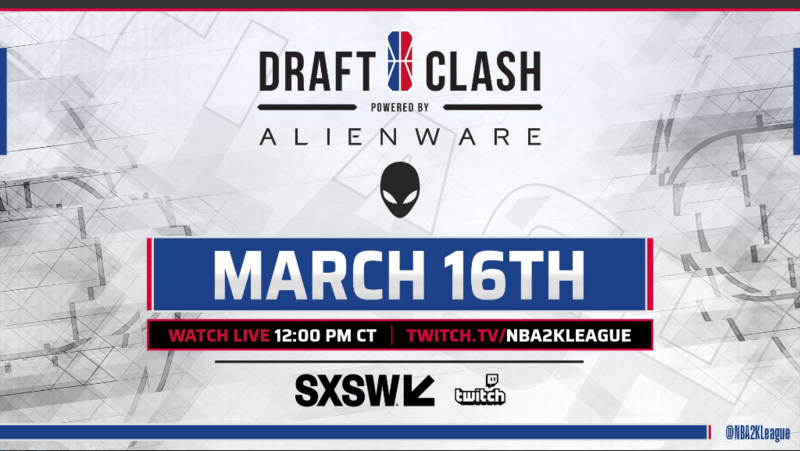 The second annual NBA 2K League Draft Clash takes place at the SXSW Conference and Festival on March 16 at 1 p.m. EST. The Draft Clash will see five rookies take on five veterans from the first season of the NBA 2K League in a series of matchups. The rookie squad features three point guards. Spencer “Ria” Wyman, the No. 1 overall pick in the draft, will represent Jazz Gaming. Zach “Vandi” Vandivier, Grizz Gaming’s first-round pick, will get a chance to showcase the scoring talent that made him the seventh overall pick in the draft. One of the most popular players in the community, Michael “BearDaBeast” Key fell to T-Wolves Gaming at the eleventh overall pick. Chiquita “Chiquita” Evans, the first woman to be drafted into the NBA 2K League, rounds out the starting five for the rookies. Hawks Talon GC point guard Devin “DevGoss” Gossett, Atlanta’s first-ever entry draft pick, will represent the Hawks at the Draft Clash. Few rookies are as heralded as Gossett, who made his name in NBA 2K tournaments before the NBA 2K League began. He coached Magic Gaming for the second half of the season, but his true passion was in becoming a player. The veterans have the experience of a full season under their belts. Artreyo “Dimez” Boyd, the first-overall pick in 2018, will run point guard for the vets. Pacers Gaming sharpshooter Nichk “Swizurk” Grech will likely join him in the back court. Tim “oLarry” Anselimo, whom Cavs Legion GC acquired from T-Wolves Gaming in an expansion draft-day trade, figures to slot in at forward alongside 76ers GC veteran Alexander “Steez” Bernstein. Dayvon “Goofy757” Curry won the inaugural NBA 2K League Finals as part of the Knicks Gaming underdog story. The Knicks rebounded to win the Finals after a difficult regular season, coming together in time for the Ticket tournament and the playoffs to win the league’s first-ever title. It remains to be seen what game build the Draft Clash will be played on. The pick-and-roll chemistry of Boyd and Curry, who played together during the offseason on the Pro-Am team Breakout, may pose some challenges to the guard-heavy rookie lineup. The rookies will have had far more experience if the game takes place on the NBA 2K League combine build. There’s no clear favorite. While they’ve already earned their spot in the league, the rookies feel like they have something to show the veterans. If the rookies have earned it, these veterans have proved it. Curry, always the competitor, never backs down from a challenge. If the Draft Clash is to have a winner and a loser, Curry always wants to make sure he’s the winner.